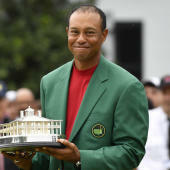 With one round to go in the 2019 Masters, Tiger Woods surged to within two shots of the lead after firing a 67 on Saturday to get to 11-under par. He's tied with Tony Finau, who moved a whopping 14 spots up the 2019 Masters leaderboard on Saturday. Both are chasing Francesco Molinari, who leads the 2019 Masters field at 13-under par after shooting a 66 on Saturday. The latest 2019 Masters odds heading into Sunday have Molinari as the favorite at 7-4, with Woods close behind at 3-1. Brooks Koepka, who is three strokes off the lead at 10-under par, is getting 6-1 Masters 2019 odds as he looks for his fourth major title since 2017. Sunday's action at Augusta National Golf Club gets underway at 7:30 a.m. ET, with Woods teeing at 9:20 a.m. ET in the final group alongside Molinari and Finau. Before locking in any 2019 Masters picks for the final round, be sure to see the top PGA predictions from the proven model at SportsLine. SportsLine's prediction model, built by DFS pro Mike McClure, has nailed four of the last eight majors entering the weekend, including Patrick Reed's groundbreaking win last year at the Masters. It also called Tiger Woods' deep run in the PGA Championship despite being a 25-1 long shot. The model has been spot-on early in the 2018-19 season. It was high on champion Rory McIlroy at the 2019 Players Championship, projecting him as one of the top two contenders from the start. It also correctly predicted Brooks Koepka's (9-1) victory at the CJ Cup earlier this season. Additionally, it correctly called Bryson DeChambeau's (9-1) seven-shot victory at the 2019 Omega Dubai Desert Classic. Anyone who has followed the model is way up. Now, it has simulated the final round of the Masters 2019 and there are some huge surprises. One major surprise the model is calling for: Woods, a four-time Masters champion and one of the top Vegas favorites entering the fourth and final round, barely cracks the top five. It's a surprising pick because Woods fired a third-round 67 to surge into a tie for second place with Finau, just two shots behind Molinari. But McClure's model has taken into account that while Woods has had several strong performances since his 2018 return, he's struggled to close out wins. Since 2018, he's had nine top-10 finishes, but just one victory during that span. There are far better values than the 3-1 premium Woods commands. Another one of the surprising 2019 Masters picks for Sunday: Xander Schauffele, a 30-1 long shot, climbs the 2019 Masters leaderboard despite entering the final round tied for seventh at 8-under par. It's been an up-and-down Masters 2019 for the 25-year-old, who has an Official World Golf Ranking and FedEx Cup ranking in the top 10. He shot a 73 on Thursday, then bounced back in head-turning fashion with a 65 on Friday before firing a 70 on Saturday. But with two wins on the 2018-19 PGA schedule already, Schauffele has shown he knows how to finish. Additionally, he's 18th on the PGA Tour this season in birdie average (4.41 per round) and fourth in holes per eagle (76.5), so he has the ability to post an extremely low score. He has all the tools needed to climb the 2019 Masters leaderboard in a hurry on Sunday. Also, the model says five golfers with odds of 30-1 or longer make a strong run at the 2019 Masters title, including a mammoth long shot. Anyone who backs these underdogs could hit it big. So who wins the 2019 Masters? And which long shots stun the golfing world? Check out the 2019 Masters odds below and visit SportsLine now to see the full 2019 Masters projected leaderboard from the model that nailed the winners of four golf majors.